This peak is #25 on the Height List for Alberta . 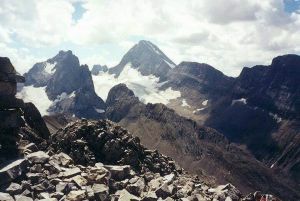 This peak is #25 in Prominence List for Alberta . This peak is #45 on the Height List for British Columbia .Located directly SW of Mount Robertson and was named in 1916 after Field Marshall Sir Douglas Haig, who was a commander in the British Armies fighting in France during World War I. The normal route follows the west ridge and was the original line of ascent. There are also established Alpine routes on the NW face and E ridge which are detailed in Sean Dougherty's guidebook. See: Selected Alpine Climbs in the Canadian Rockies. As detailed in Dougherty's guidebook, the NW face was ascended by the great Don Gardiner in a stellar 11 hour return trip, quite a feat. Name Notes: Adopted in 1918, after Field Marshall Sir Douglas Haig.